While changing the colors of fonts are easy for your brochures designs, adding specific glass textures might be a lot more harder for the newbie designer. Fret not though, because it is not that hard to actually do this through Adobe Photoshop. In this tutorial, you will learn how you can convert your text with a glass type texture plus all the glitter and glint effects that come with it. This is perfect for your advertising covers for brochures, booklets and catalogs, especially if you are going for that smooth, glass and glossy theme. So just follow the steps below and discover what you can do. 1. First, let us setup the document. Simply go to File -> New… to open the New Document window. 2. Choose the size that you want. Remember that for web images 72 is good for resolution while for printing 300 is recommended. 3. For now, leave your background white and press ok.
4. Right now, our background is white. Since we are creating a glass type text, it would be good to have a coloured background. 5. So for this tutorial, we copy-pasted a textured type color background as a good contrast to glass text. 6. Next, we place our text. Just use the text tool and type in the text you want. Use white color for now for the text. Of course, choose the appropriate font style that you want for your theme. 7. Now, let us edit the text to make it look a bit more solid and three dimensional. Right click on the text layer and select the option to add blending options. 8. Once the layer style window opens, click on the checkbox for Bevel and emboss. 9. Change the altitude attribute to the 70-80 range. 12. Now, we have something almost glass like, but not quite of course. The next step is to change the “fill” of our text to a transparency to make it look like glass. So go back to the blending options, and click on the “Blending Options: Default” section. 13. 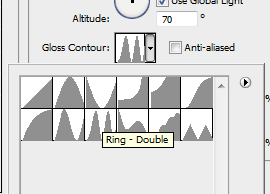 Under “Advanced blending, drag the fill opacity slider to the left. Make it 5%. 14. Afterwards, to add more realism to your glass text, tick on the checkbox for “drop shadow” as well. 16. Now you should have text that is transparent, but have glossy glassy edges and a shadow. 17. Change the background and see how it looks on different textures and colours. 19. Now, here is the great part of this technique. You can apply it to any layer actually. Including shapes and graphics. 20. So it all depends on your creativity really, but you can basically turn anything into glass.